We will walk through your home with you and ask you to show us any spots you are concerned with. We will identify potential permanent stains, and give you an idea of what you can expected from cleaning, as well as listen to any concerns you may have. Dry soil is removed by thoroughly vacuuming with a quality vacuum cleaner (Pro-Team Commercial, Dyson, Kirby, and most Central Vacuums work great!). Removing dry soil is one of the most important steps in any cleaning process. Dry soil accounts for up to eighty percent of soil in carpet. We appreciate you thoroughly pre-vacuuming your carpet the day before your cleaning. We appreciate you moving as much furniture as possible before we arrive, as this will make your cleaning experience run much smoother. If needed, we will be happy to assist you in moving the couches, chairs, coffee table, and end tables living room. Unfortunately, we do not move anything larger or heavier than that, such as beds, dressers, china cabinets, bookshelves, sectional sofas, tv stands, etc. If you would like any large item cleaned underneath, please have it moved completely off the carpet prior to your appointment. Sliding heavy furniture across the carpet damages/stretches the carpet backing, and will cause your carpet to develop wrinkles. A pre-conditioning solution is sprayed on the carpet to emulsify/break down the soil throughout the carpeting. We use Procyon, which is Green Seal Certified, Asthma & Allergy Certified, and CRI Certified. We feel it is the healthiest cleaning solution you can have. There are no dyes, fragrances, butyl or other toxic chemicals. 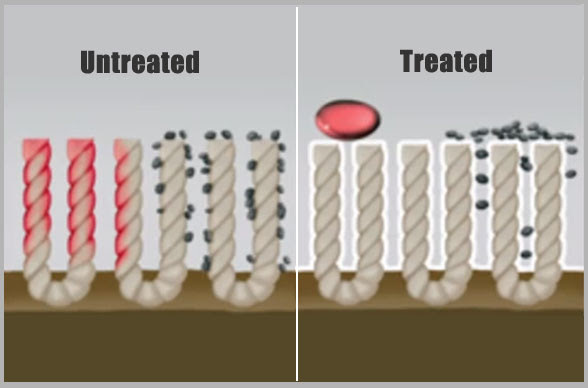 Difficult spots are pre-treated with special spotters uniquely designed to increase chances of removal. We can handle most issues such as pet urine, ink, red stains, coffee, etc. We have been told by several clients we have removed stains that other cleaners have tried to get out for years! A rotary machine is used to further loosen the soil. The carpet is then thoroughly rinsed with our powerful “Rotary Hot Steam Extraction” cleaning system without over-wetting the carpet or leaving a sticky residue behind. We clean every carpet with clean, soft, treated water. This will also leave your carpet feeling soft and fresh, without residue. Easier carpet care for you – Vacuuming and spot removal yields better results. Carpet and upholstery stays looking new longer – Delays permanent damage and increases carpet life. Better appearance – Greatly reduces ugly traffic lanes. Residential nylon carpets are treated with 3M Scotchgard from the factory. After a period of 1 to 2 years, some of the soil-resistor wears off. At that point you should consider having your professional carpet cleaner re-apply the treatment after professional cleaning. Scotchgard will help the soil slide off of the carpet easier when vacuuming, spots will be easier to remove, and professional cleaning will be more effective. Unprotected carpet soils faster, doesn’t last as long, and is more prone to permanent staining. Your carpet cleaning is finished with a carpet groomer, which helps the carpet pile dry faster, and ensures even coating of the carpet protector. High velocity air movers are placed on the carpet immediately after cleaning to promote faster drying. Most carpet takes roughly 4-6 to hours to mostly dry, but it does take a day or so for everything to completely evaporate. Good airflow and heat are crucial to helping carpet dry. In the summertime, we recommend opening the windows and turning the ceiling fans on high. In the winter, we recommending turning the thermostat up a few degrees and turning the central fan to ON for circulation. The more airflow circulating in the home, the quicker the carpet will dry. After cleaning, we will walk through your home with you to point out the cleaning results and make sure that you are completely thrilled with the job. Great job on my tile!